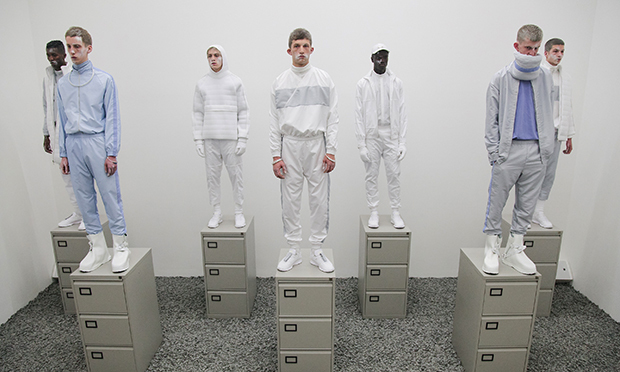 Dalston menswear duo Cottweiler has been awarded NEWGEN MEN support, to showcase its SS16 collections on schedule at London Collections: Men in June. The NEWGEN initiative supports young designers and brands at a crucial stage in their careers, nurturing their creativity while promoting their commercial potential. Matthew Dainty and Ben Cottrell have attracted attention for their understated approach to sportswear, exploring innovative textures and logo-less fabrics in their reimagining of the tracksuit, sports jacket and sweatshirt. They have also created bespoke costumes for FKA twigs’ first tour, which included sheer mesh tracksuits studded with jewels. Alongside Cottweiler this year are two other newcomers – PIETER and Bobby Abley (formerly of Fashion East support). Existing NEWGEN designers include the likes of East Londoner Nasir Mazhar and Central Saint Martins’ alumnus Craig Green. For Spring Summer ’15, Cottweiler’s collection was awash with swimming pool blues and terracotta browns, with toweling and flannel put to good use in a reinterpretation of summer holidays. For AW15, the pair returned to stark monochrome tones, injected with details in concrete grey and powder blue. Comfort, through breathable fabrics and high stretch materials, is an ongoing consideration, while the likes of Teflon-coated cotton and innovative techniques continue to push the label in new directions.